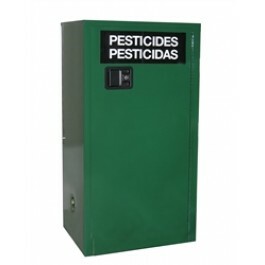 Pesticide Cabinet provides safe, secure and controlled storage for pesticide products. 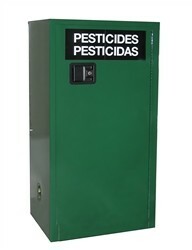 Farms, nurseries, parks and recreation facilities can safely store pesticide chemicals and equipment. Helps restrict the handling of pesticides to those who have been appropriately trained and authorized per EPA/WPS. Choose the model to segregate and securely store up to 120 gallons of product. All cabinets are FM approved and comply with current OSHA regulations and are designed in accordance with the standards of NFPA.